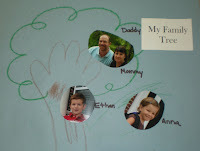 Our "All About Me" unit finishes up with a family page in the Me Book. Throughout the years I have done many different types of activities for this page. We have sponge painted people and pets, but this can take quite a long time if you have some big families. We have had different pictures representing family members and pets, but I was never completely happy with that idea. We have even had the children try to draw the members, but at this time of the year there were not too many recognizable drawings. A little while ago I came across a really neat family tree for the children,(sorry I can't remember where). The one little catch is that all the families need to provide pictures of their families for the activity to take place. I was lucky to get most of the pictures in by yesterday. The children that didn't have them made their trees, and we will add the pictures later. I traced the children's hand and forearm for the trunk of the tree and asked them to color it brown, then we colored a green top. I had asked the parents to send in small circular shaped pictures of family members and pets if they liked. 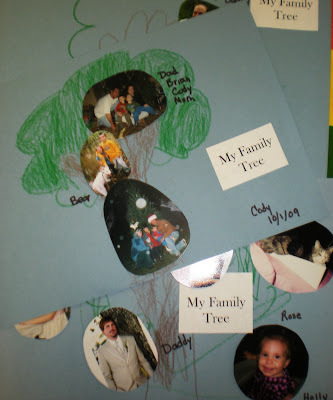 Then I had the children glue the pictures to their trees and tell me who the people were in the picture. I was very pleased with the final project and hope to continue this. We also were still talking about apples which was brought about by our color of the week; RED. 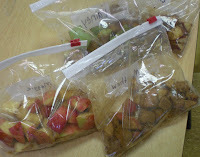 I had each children bring one apple to school, any color they liked. (I know way too much homework for parents--You guys have been great!) The first thing we did was make a graph to see what color apple we had the most of. I had made the chart and the children colored in the correct square for their apple. The red apple won for both classes hands down. Now it was time to make a great treat with those apples. 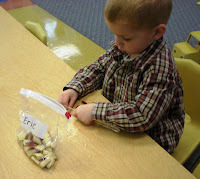 I found some APPLE SHAKEUPS on Totally Tots that looked easy, fun, and yummy. 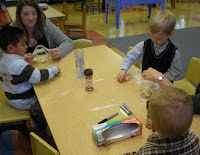 I had parent helpers for this activity which worked out wonderfully too--THANKS MOMS! I had the parents cut the apple in slices. 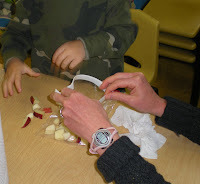 Then each child got a plastic knife to cut the slices into chunks. After they cut them they put them in a bag, sprinkled them with cinnamon, shook the bag up, and enjoyed. They were really quite good. 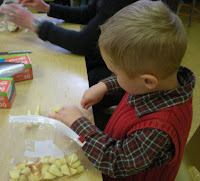 It was so cute to see the looks of concentration as they cut those apples into pieces. They did a great job. I also had the light table out today for the first time. The AM class really enjoyed it, the PM class was a bit more reserved. 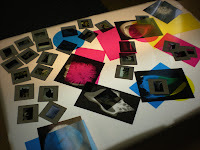 I had found lots of old slides this past summer which I think many of them found fun to look at. 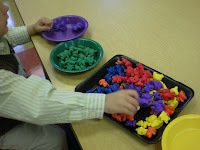 I had the sorting bears out today which they had great fun with. They sorted by color and size, and made some families too. Off on our first field trip next week for a fun fall nature hike. I pray the weather cooperates. Cute family tree idea. I will have to try that activity with my boys. They will love looking at all the pictures of their family members.